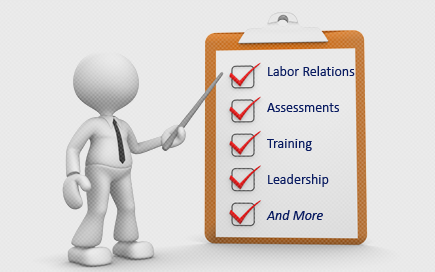 Labor Relations News Update April 28, 2014 | Oliver Bell, Inc. These shifted costs are represented by an increase in high-deductible plans, a greater number of plans with co-insurance charges, higher out-of-pocket maximums and increases in emergency room (ER) co-pays, according to findings from the 2014 Medical Plan Trends Report from benefits management firm HighRoads and consultancy CEB. The trend is expected to speed forward as 2018 approaches, when the ACA will impose on employers a 40 percent excise tax on total health plan premium costs that exceed $10,200 for individual coverage and $27,500 for a family, indexed for inflation. Growth in high deductibles. In 2014, employer plans with high deductibles (at least $1,250 for individuals or $2,500 for families) grew to 25 percent, up from 23 percent in 2013. Higher out-of-pocket maximums. Two-thirds of employer health plans (66 percent) had individual, in-network out-of-pocket maximums of $2,500 or more in 2014, up from 58 percent of plans in 2013 and 49 percent in 2012. Shift toward co-insurance. Forty-two percent of employer plans charged co-insurance (an out-of-pocket percentage of the provider’s fee) for office visits, up from 35 percent in 2013. This was accompanied by a drop in flat-dollar co-pays, from 65 percent of plans in 2013 to 58 percent of plans in 2014. Increase in ER co-pays. Per-visit emergency room co-pays have increased by roughly $3 per year since 2009, with a 2014 average of $113 per visit. Making sure plan participants have cost information can reduce the likelihood of their delaying or rationing care by as much as 50 percent. An out-of-pocket maximum for individual coverage above $2,000 leads to a precipitous drop in employees’ perceived value of their medical benefits. Health plan communications should emphasize strategies and decisions employees can use to manage their health care costs and should stress how uncommon it is for the average employee to reach the out-of-pocket maximum. Plan designs that incorporate a 1-3-5 ratio for primary care physician relative to urgent care, relative to emergency room co-pays, prompt thoughtful decision-making and discourage unnecessary ER visits. For prescription drugs, moving from a 1-3 to a 1-4 ratio of generic to brand-name co-pays can save an organization a significant amount per year. Premium increases leveling. In 2014, the average monthly health plan premium for large group plans was $870 (including employer and employee contributions), an increase of 15 percent since 2010. However, after a spike of 6.9 percent between 2010 and 2011, the rate of increase moderated and premiums rose 1.7 percent between 2013 and 2014. The cause of moderating premium costs may have been due, in part, to an increasing number of employers using high-deductible health plans with higher co-pays, or implementing spending accounts and consumer-directed health plans, the report noted. Premium per covered life fairly constant. Employees with higher incomes tended to incur higher premiums, but they also covered more dependents. When premiums were adjusted for total covered lives—considering each insured person rather than each employee—premium costs were fairly constant among income levels, averaging $411 per month in 2014. Dependents on parent’s plan until age 26. Several trends could be linked to the ability of dependents up to age 26 to stay on a parent’s health policy if the plan offers dependent coverage. Higher premium costs in older age groups may have been linked to the growing likelihood that a covered employee could have covered dependents who may be up to age 26. Among those age 30 and under, the coverage acceptance “take rate” declined 7.6 percent between 2010 and 2014. Employers contributing slightly less. In 2014, large employers contributed 74 percent of the premium cost for those with dependents, whereas those with no dependents experienced a 77 percent employer contribution share. Employer contributions to health premiums declined slightly for all groups from 2010 to 2014, within a tight range of -1.0 percent with no dependents to -1.5 percent with dependents. When designing additional cost shifting in their health plans, employers should keep in mind that the ACA also requires that plans be “affordable” and provide “minimum value.” Affordability is determined if the plans meets one of the three IRS safe harbors for determining that the employee’s contribution for self-only coverage doesn’t exceed 9.5 percent of the employee’s household income. Minimum value requires that the plan covers at least, on average, 60 percent of an employee’s medical expenses (see the SHRM Online article What’s ‘Affordable’ Coverage Under the Affordable Care Act?). FORT WORTH (CN) – Labor unions and protesters behind mass demonstrations at Wal-Mart Stores must face trespass allegations in Texas, an appeals court ruled. Wal-Mart had filed suit last year against the United Food and Commercial Workers International Union, North Texas Jobs with Justice, Lester Eugene Lance, 10 unknown individuals, and Organization United for Respect at Walmart (OURWalmart). The complaint in Tarrant County Court accused the groups of having repeatedly entered Wal-Mart stores, ignoring no-solicitation signs, blocking roads in and out of parking lots, screaming through bullhorns, displaying banners and signs, and Holding flash mobs. A judge refused to dismiss under the Texas Citizens’ Participation Act, which requires defendants to show by a preponderance of the evidence that the allegations stem from their exercise of a constitutional right. The union also failed to show that Wal-Mart had consented to its entry onto store property as an invited shopper. A three-judge panel with the 2nd District Court of Appeals affirmed Thursday. Assuming United Food met its burden, the burden then shifts to Walmart to show “by clear and specific evidence a prima facie case” for each element of trespass, according to the ruling. A spokesman for the union did not return a request for comment. WASHINGTON, D.C. — The average age at which U.S. retirees report retiring is 62, the highest Gallup has found since first asking Americans this question in 1991. This age has increased in recent years, while the average age at which non-retired Americans expect to retire, 66, has largely stayed the same. However, this age too has slowly increased from 63 in 2002. These trends in Americans’ actual vs. expected age of retirement are from Gallup’s annual Economy and Personal Finance survey, conducted April 3-6, 2014. As part of that survey, Gallup asks retired Americans to report the age at which they retired, and non-retired Americans the age at which they expect to retire. Americans’ average self-reported age of retirement has slowly moved upward. Gallup conducted several polls in the early 1990s and found that the average retirement age was 57 in both 1991 and 1993. From 2002 through 2012, the average hovered around 60. Over the past two years, the average age at which Americans report retiring has increased to 62. Retirement age may be increasing because many baby boomers are reluctant to retire. Older Americans may also be delaying retirement because of lost savings during the Great Recession or because of insufficient savings even before the economic downturn. Meanwhile, the average age at which non-retired Americans expect to retire has also increased over time, from 60 in 1995 to 66 this year. Furthermore, in 1995, more non-retired Americans expected to retire younger — 15% expected to retire before age 55, compared with 4% in 2014. The age at which Americans expect to retire has been consistently higher than the average age at which they actually retire since Gallup began tracking both. This likely reflects changes in Social Security eligibility as well as the more challenging economic circumstances working Americans currently face. Today’s workers are also less likely to have an employer-sponsored pension, and they may still be recovering financially from the Great Recession. About 30% of non-retired Americans in all age groups expect to retire before the age of 65. But 11% of 18- to 29-year-olds expect to retire before age 55, a much higher percentage than other groups. This could be because younger Americans, given the many years they have until retirement, may not understand the financial realities and challenges of funding retirement that middle-aged Americans are more familiar with. The majority of all age groups expect to retire at age 65 or older. This includes 62% of 18- to 29-year-olds, 62% of 30- to 49-year-olds, and 58% of 50- to 64-year-olds. At the same time, an optimistic 15% of the youngest age group expect to retire before age 60. Adults closer to that age are naturally less likely to think they will be ready for retirement by that point. The pressure to be financially prepared for retirement is evident in the recent Gallup finding that saving for retirement is Americans’ top financial worry. According to a 2011 Wells Fargo/Gallup Investor and Retirement Optimism Index survey, the value of investments is the key factor determining when pre-retired investors say they will retire, followed by their health, the cost of healthcare, and inflation. However, according to a more recent Wells Fargo/Gallup survey, U.S. investors are highly cautious about retirement savings, saying they would prefer secure investments with low growth potential over investments with high growth potential and a risk of lost principal. 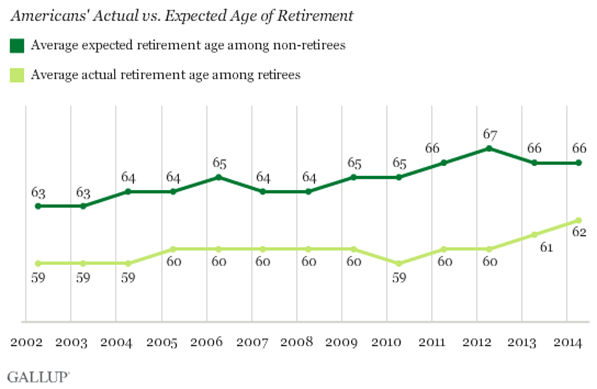 Although Gallup has always found a consistent gap in the age at which retired Americans report retiring and the age at which non-retirees expect to retire, both averages have crept up over the past decade. This likely reflects the changing landscape of retirement, including longer life spans, changes in Social Security benefits and employer-sponsored retirement plans, and lifestyle choices such as a desire to keep working after reaching the traditional retirement age. Given these trends, Americans’ average retirement age being lower than their expected retirement age may reflect today’s retirees hailing from a different generation. In the future, the average retirement age and expected retirement age may converge as current workers retire later in life.